On the way to Houghton Hall, rattling through Cambridge and its throngs of teenagers returning from college open days, and on up to King’s Lynn, we conjectured about the time it would have taken the original owner of the Hall to get to London. Sir Robert Walpole built Houghton in the 1720s, while Chancellor of the Exchequer and later Britain’s first Prime Minister. He spent only a few weeks of every year in Norfolk. Without metalled roads, and with poorly sprung horse-drawn carriages, it would have been a desperately uncomfortable journey, lasting perhaps three days. Norfolk would have been authentically remote, in relation to the capital city and centre of Empire. Though he never took a grand tour, nor even once left Britain, Walpole amassed an outstanding collection of over 400 European paintings and sculptures in his Palladian mansion in Norfolk. The house is remarkably preserved and over the past twenty years the grounds have been slowly returned to their original scheme, following the wartime years when land was turned over to the production of food. 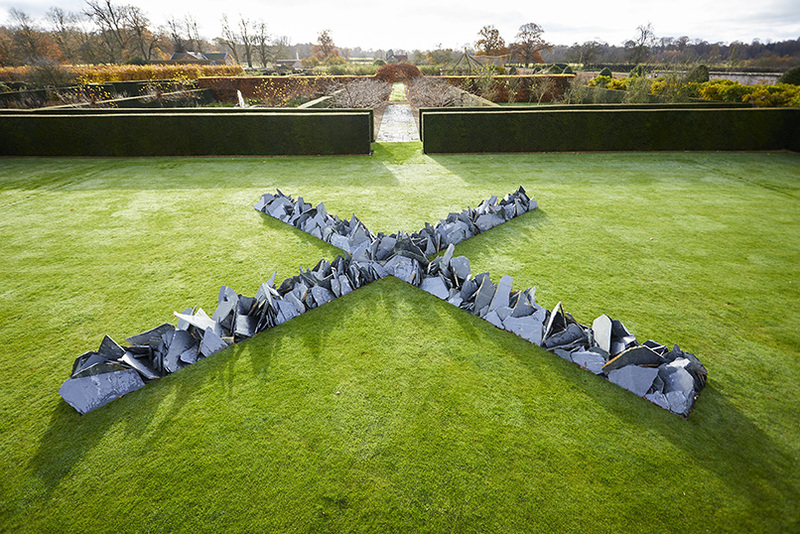 The present owner, David, 7th Marquess of Cholmondeley not only honours the work of his late grandmother, Sybil, who so loved the gardens of Houghton, but has established a substantial collection of contemporary sculpture. 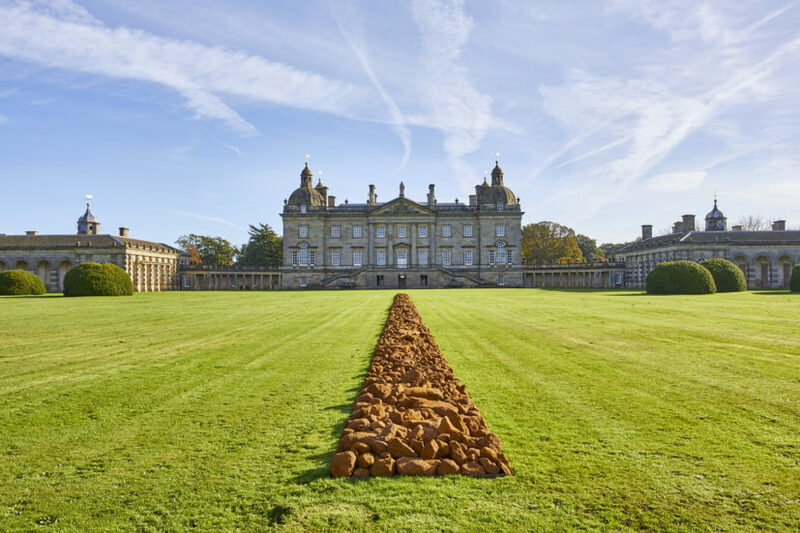 Relationships with artists established through his commissions have lead, in the case of James Turrell and Richard Long so far, to major temporary exhibitions of their work at Houghton. 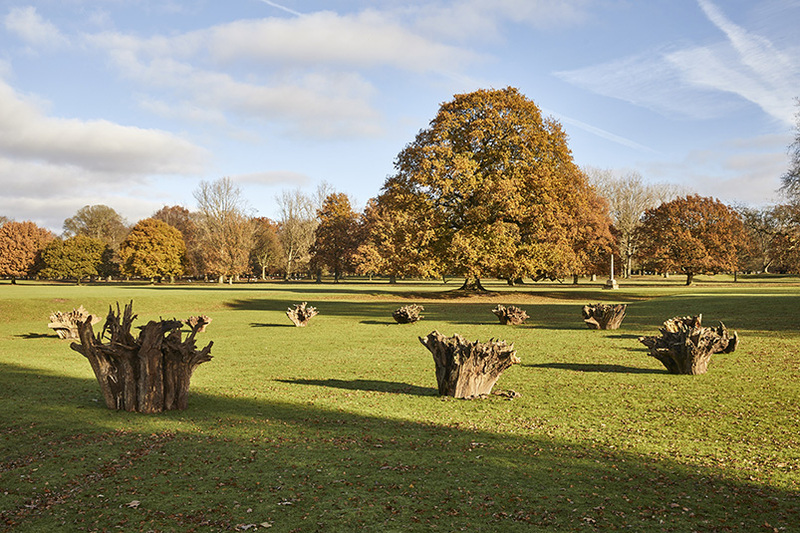 Richard Long has installed five new site-specific works in the house and grounds, as well as a gallery of his photographic and text works. Curated by Lorcan O’Neill, this is a serious and substantial exhibition that is a deft and elegant engagement with the architecture and landscape of Houghton. Full Moon Circle was commissioned in 2003. 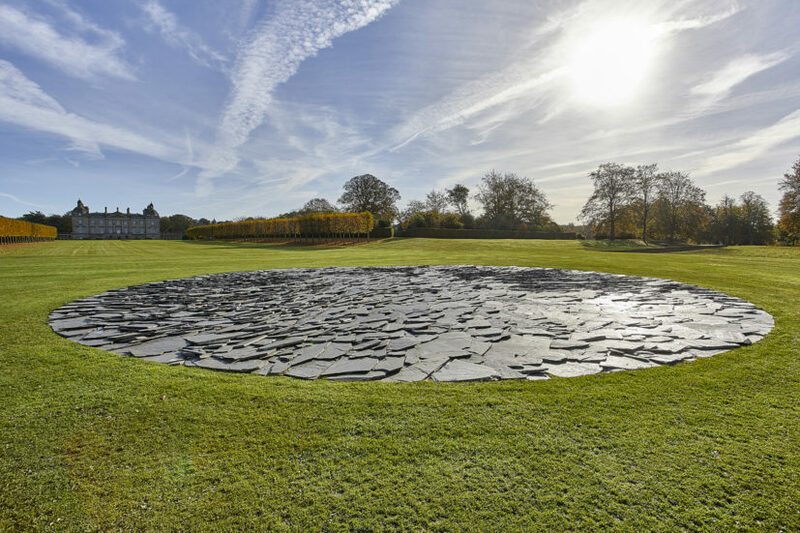 A vast, perfect circle of overlapping slates, the work sits on the west lawns of the house, its softly reflective surfaces responding to every changing nuance of light. From the terrace of the house one looks towards it over A Line In Norfolk, 2016, a line of rust red local rock, matte and textured, aligned perfectly with the severe symmetry of the house. The perspective offers a layering of texture, as well as form, that incorporates the perfect green lawns and beyond them, yellowing fields of pasture, then trees. Landscape is Long’s medium; repetition, symmetry and measurement have defined his work since the 1960s when he was a student at St Martin’s in London. There is an elemental muscularity to Long’s engagement with the material of landscape, a zen-like simplicity of gesture that, without denying a relationship to the English landscape tradition, aligns him with American artists such as Robert Smithson, Carl Andre and Richard Serra. On the other side of the house, White Deer Circle, 2016 is something entirely new. Found wood is a material Long has used since he was a student; but here he has taken stumps of trees from the estate and created something akin to a Neolithic henge. The stumps sit on their cut edge, the remains of their roots reaching into the air. Each one so different, so redolent of age, they have an animistic quality that recalls Paul Nash’s surrealist photographs. Long’s practice, based on walking and solitary communion with landscape, gives him an affinity with primitive man. The elemental forms he has used throughout his career: the circle, line and spiral are universal, his engagement with materials personal – “walking, lifting, placing, carrying, throwing, marking”. A single work is installed inside the house: North South East West, 2017 is composed of Norfolk flint and Cornish slate. It is aligned with the four cardinal points of the compass, revealing that the house itself is not. 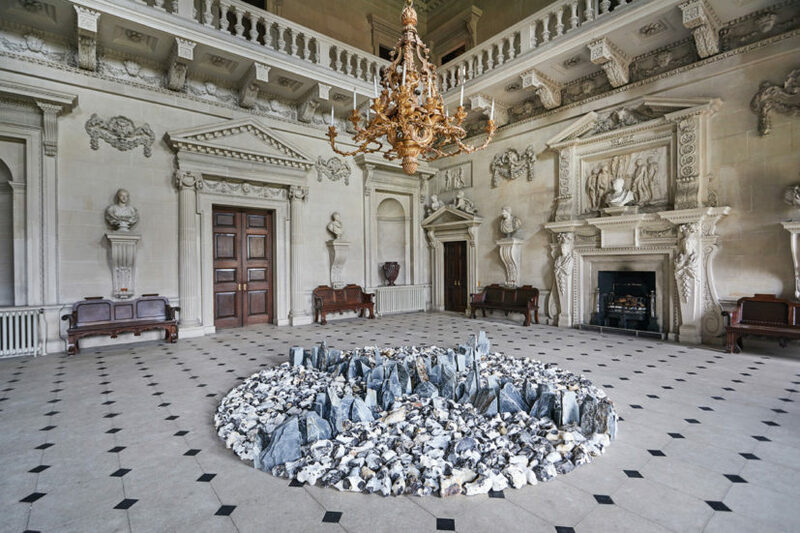 The work sits in the Stone Hall at the very centre of the house, bringing another register of greys to this extraordinary neoclassical architecture, with its gilt chandeliers, roman busts and bronze copy of the Laocoon. 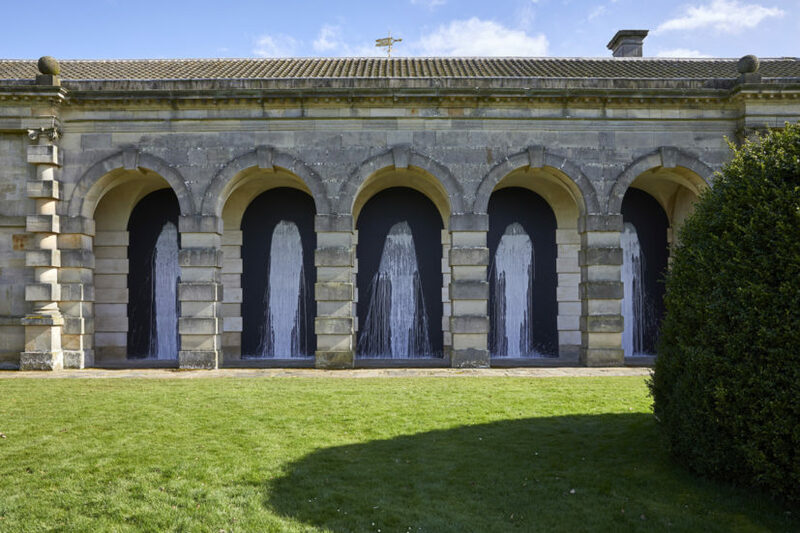 In the arches of the colonnades to either side of the house Long has made a series of wall works titled White Water Falls, 2017. 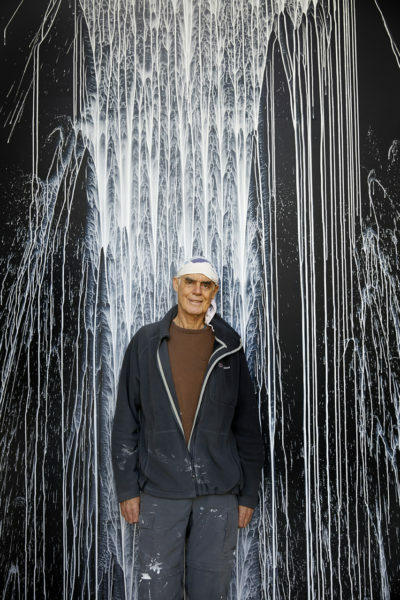 Against a black ground, the artist has thrown white pigment that cascades more than two metres to the floor. Ostensibly the simplest of gestures, these are works whose complexity unpacks itself over time: one reads in to them the physical act, the effort required to launch liquid in such quantity; the eye interrogates the layering of paint, the separation of chalky pigment from liquid medium leads you to think of the geological origin of the paint. Just as a cross is the most universal way to mark place, this gestural splash seems the most indexical means of stating the presence of a human being. King’s Lynn is a mere hour and a half by (air conditioned) train from London, but Houghton is still a world away from the clamour and relentless politics. EARTH SKY is Richard Long at the top of his game, and should really not be missed.